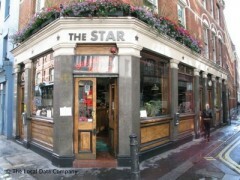 About: Star Cafe is a very Italian cafe serving a selection of hot and cold meals including sandwiches. It is a great place to sit and watch Soho go by whilst reading the newspapers that are provided daily. This place is what London is and always should be about. Traditional, historic and authentic. Such lovely food and great service with CHARACTER ! If you haven't been here then you are missing out on one of the few original Cafe's left in London. It should be an english heritage site LOL !!!! visited 28th may 2009 for breakfast. Fantastic choices available on the menu, poridge, cereal, frut salad, kippers as well as all the usual trad english brekkie. I opted for special k + toast & marmalade. Whilst the other half ate a full english which included chips. All of this was served promtly and was fresh & tasty. all of this icluding a big cup of tea & a large orange juice came to around £13.